Archbold pitcher Chloe Schramm fields her position and throws over to first for an out during Monday’s NWOAL softball opener versus Bryan. The Blue Streaks defeated Bryan by a 9-7 final. 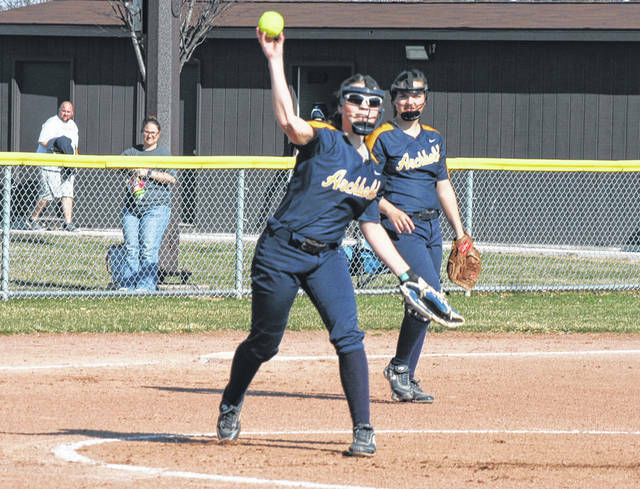 In a high-scoring affair, Archbold tallied five combined runs in the third and fourth innings to grab the lead for good in what turned into a 9-7 win over Bryan to begin the Northwest Ohio Athletic League softball season Monday. Chloe Schramm went 2 for 3 with two runs batted in for the Blue Streaks offensively. Faith Wyse (1 for 4) also had two RBIs, while Kylie Sauder finished 2 for 3 with an RBI. Breanna Long went 1 for 3 with a pair of RBIs for Bryan. Andee Grime pitched four innings in relief of Schramm to earn the win in the circle. She scattered four hits and allowed just one earned run. Schramm was charged with six runs, only one that was earned, on three hits in the first three innings. Addie Arnold took the loss for the Golden Bears. Archbold hosts Swanton today and is at Lima Bath for a tri-match with Bath and Findlay on Saturday.